The Hidden Treasures Video Series, hosted and written by Marcia Brown and Christie Romero of Venture Entertainment Group, has just merged its collection of educational videos with the Asheford Institute of Antiques (A.I.A.) home-study program. Both Ms. Brown and Ms. Romero are considered two of America's authorities on old jewelry. Both women have written extensively on the subject, and bring a good deal of lifetime experience to their videos. Ms. Romero hosts, “A Collectors Guide To Antique And Vintage Jewelry Of The 19th And 20th Centuries”, while Ms. Brown concentrates her efforts on such subjects as, “Rhinestone Jewelry”, and “Signed Costume Jewelry”. Over the past six years both Ms. Romero and Brown have put their considerable knowledge to use in the form of eight comprehensive videos – each dealing with a different aspect of antique jewelry. "These videos are entertaining as well as instructional," commented Charlie David Green, director of the Asheford Institute. "We are pleased to welcome the Hidden Treasures Video Series to our array of quality educational materials. "excellent visual extensions" to the Institute's home-study program, which already includes a written section on the subject of antique jewelry. Venture Entertainment seemed equally pleased by the newly formed union with Asheford and qualified their position at a recent jewelry convention by stating, "Our alliance with Asheford with its long history of antique home-study educational service, conveys just the right sort of message about our video's established presence in the antique and collectible community." 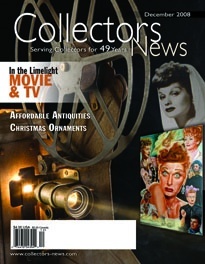 Both companies say they are “perusing” the idea of developing more videos in a number of antique related fields. Asheford Institute of Antiques is located at: 981 Harbor Blvd. Ste. 3, Dept. 275 Destin, FL 32541 or you can call them toll free at: 877-444-4508.